You can also enjoy Ebi Katsu like you enjoy Tonkatsu (Pork Cutlet). 2. Cut the shrimp in half, divide them into 4 piles, then shape them into patties. 3. Mix A, dip 2 in A, then coat with Panko. 4. Fry them in oil at 170C (340F) for 4-5 minutes until cooked golden brown. (Turn them over to cook evenly.) Remove the Ebi Katsu from the oil and drain. 5. Mix B to make Tartar Sauce. Mix C to make Aurora Sauce. 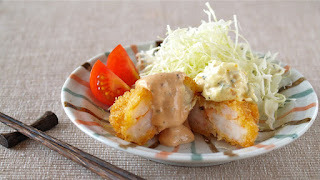 Serve the Ebi Katsu with shredded cabbage, the sauces, and a lemon wedge if you like.